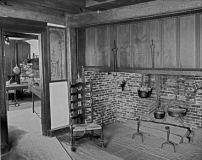 Paul Revere House (c 1680), Boston, Massachusetts; Chamber; black and white. 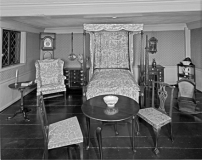 Perhaps as it appeared in Paul Revere's time with largely 18th century furnishings. 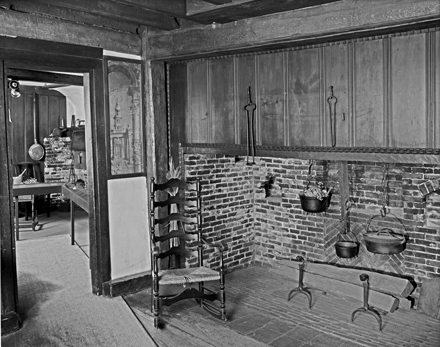 Paul Revere House (c 1680), Boston, Massachusetts; Hall hearth; black and white. 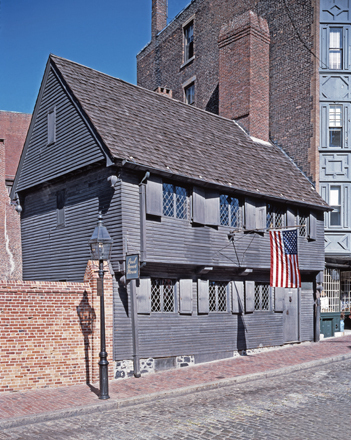 Moses Pierce-Hichborn House (1711), North End, Boston, stands alongside Paul Revere's House on North Square. 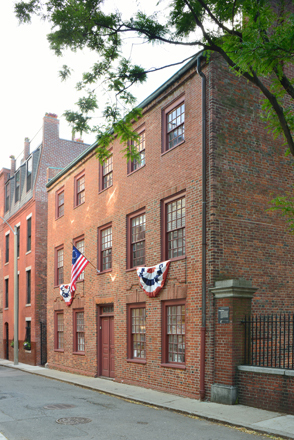 It and the Clough House are the only surviving eighteenth century North End residential buildings. 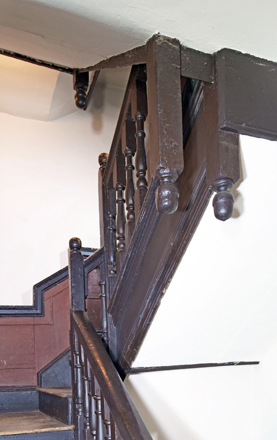 Moses Pierce-Hichborn House (1711) North Square, North End, Boston,Massachusetts ; acorn drops and newel posts at top of first stair run. 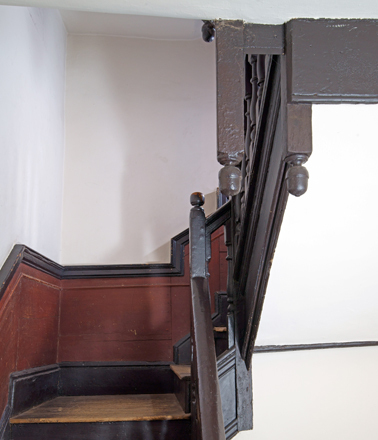 Moses Pierce-Hichborn House (1711) North Square, North End, Boston,Massachusetts; stair case from second floor. 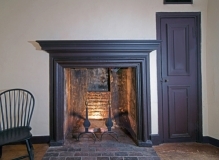 Pierce-Hichborn House (1711), North End, Boston, Massachusetts; second floor chamber hearth with bolection molding and closet door. 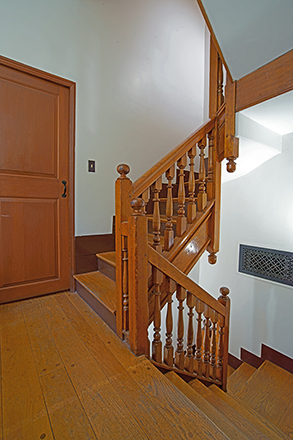 Pierce-Hichborn House (1711), North End, Boston, Massachusetts; detail of stair showing original wainscotting and drops. 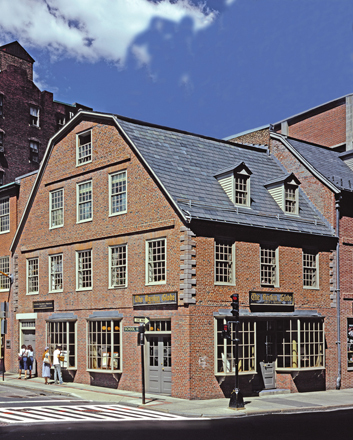 Clough House (c 1711) North End, Boston, Massachusetts. 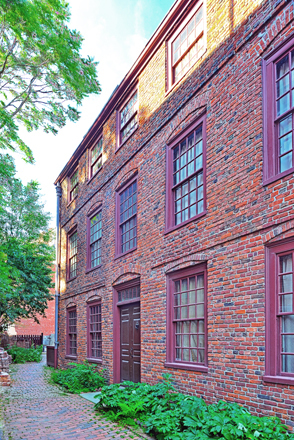 This lonely survivor of early eighteenth century North End, Boston, stands just behind Old North Church which Ebenezer Clough, its first resident helped build. 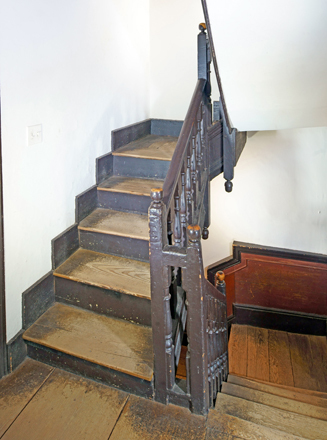 Clough House (c 1711) North End, Boston, Massachusetts; original stair from 2d floor. 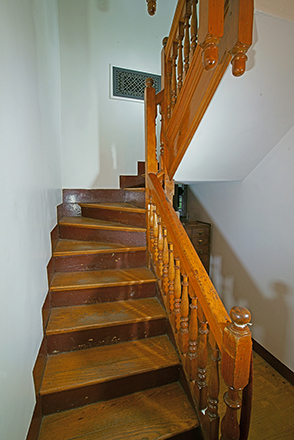 Clough House stair from first floor. 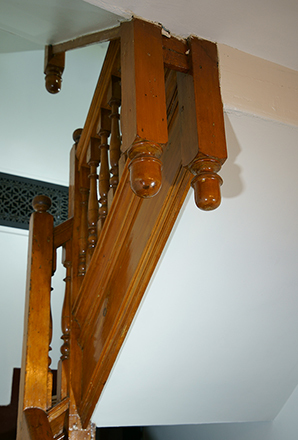 Clough House Stair; Detail of acorn pendants or drops. Clough House (c 1711) North End, Boston, Massachusetts; East room paneling. Clough House (c1711) North End, Boston, Massachusetts; Hearth - first floor. 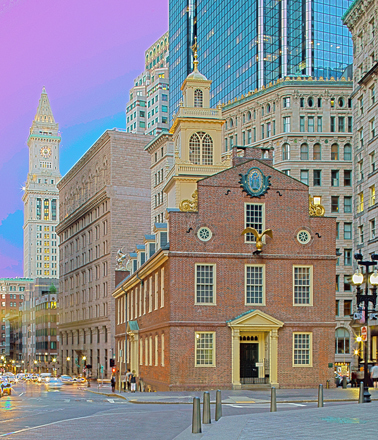 Old State House (1713), Boston, Massachusetts; East end and North side. Stepped gable end with Lion and Unicorn on opposite sides. 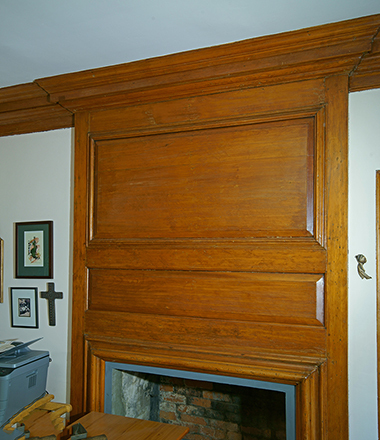 Balcony with elegant door topped by segmental pediment on Corinthian pilasters. 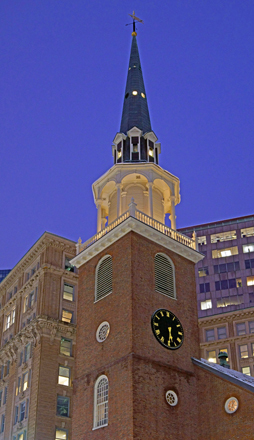 Central tower with cupola and weather vane. 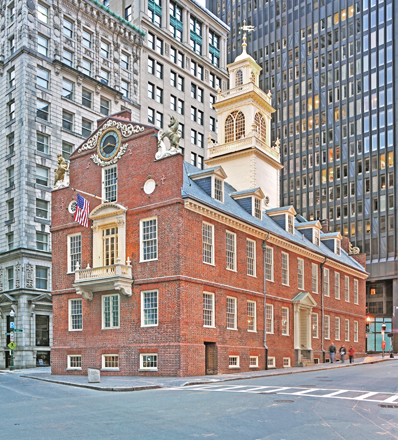 Old State House (1713), Boston, Massachusetts; West End looking down State Street. 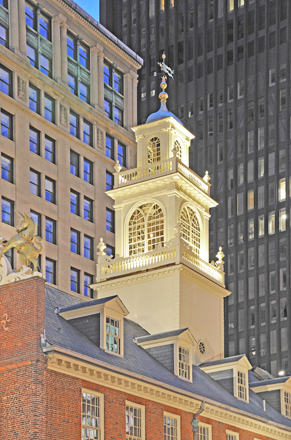 Note Seal of the Massachusetts Bay Company in gable end..
Old State House (1713), Boston, Massachusetts; Detail of Tower. 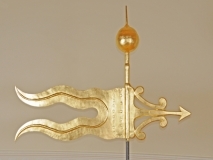 Three stages capped with cupola and weather vane. 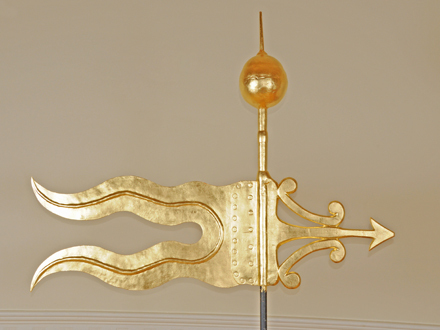 Old State House (1713), Boston, Massachusetts; Detail of weather vane (1714). 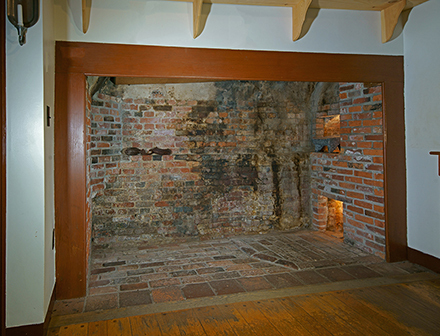 Photographed in 2008 while tower undergoing repairs.